Next on The Scoop: Does Parenting a Cat Prepare You for Parenting a Baby? 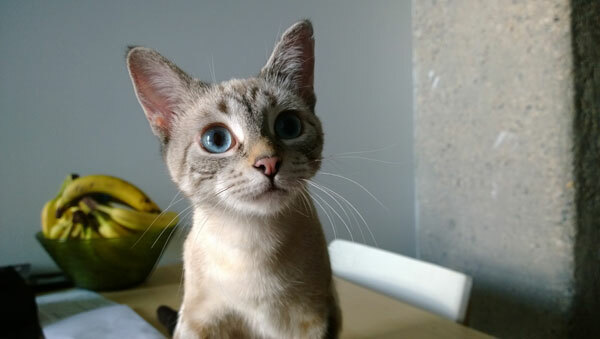 My cat knows weÔÇÖre moving, and the vet says the resulting anxiety might have made her pee red. At first, I thought Ghost Cat had eaten a piece of wayward beet. I’ve been juicing lately, so it’s not uncommon to find small bits of vegetable all over my kitchen. I’m embarrassed to say that’s why my first thought was beets, not blood. The next day, the weird red stain was still showing up in Ghost Cat’s litter, and I knew there’d been no beets to blame, so I called my vet’s office for the second time that week. I’d called a couple days before to explain that we’d be moving. My vet’s assistant said we should pick up Ghosty’s records and test out the sedative they’d recommended for the long trip in the moving truck. She said that since Ghost Cat had been seen in the last year, I wouldn’t need to bring her down. No big deal. So when I saw red in the litter, I started to worry, but figured I already had a trip to the vet’s office scheduled. I thought I’d just bring my baby cat with me and make it into a real appointment. I called the office and tried to explain the situation that was scaring me more every second. "I think she’s peeing blood," I told our vet’s assistant through tears. She told me the doc had a busy day full of surgeries and that our problem didn’t sound like an emergency — but then in the next breath she suggested we head to the animal ER at the university and wait in the triage line. Now I was really frightened. My mind was racing through worst case scenarios — including the truly horrifying prospect of an immediate future without my cuddly little Ghost Cat. My husband rushed home on his lunch hour, and while I spazzed, cried, and cuddled my slightly sluggish fur baby, my husband did web research. He found another vet that was less than a $10 cab ride away from our apartment and made the necessary phone calls while I held my cat and cried. My husband had to go back to work, so I dried my tears and put Ghost Cat in her travel harness. Soon we arrived at this new vet’s office. I struggled out of the taxi, carrying Ghost Cat’s crate as she howled from inside the little plastic prison. I also brought a Tupperware container containing a sample of the mysterious red jelly stuff and a clump of regular old non-mysterious poop (just in case the issue was somehow poop-related. I was pretty irrational by that point). 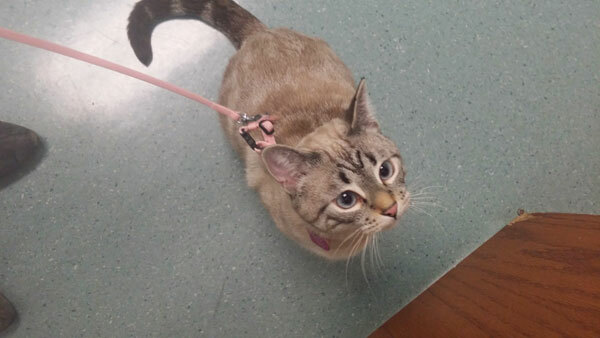 When the vet came into the exam room I explained everything — the red stuff showing up in the litter box, the question of how to calm Ghost Cat during the six-hour drive, and why I was at her office instead of my regular vet’s. This new vet said straightaway that she didn’t think antibiotics and sedatives were the way to go, and she recommended diet changes for the red pee problem and natural calming supplements for the upcoming move. I was pleasantly surprised to hear she wasn’t jumping straight to drugs — but her recommendation of Feliway and naturopath leanings later earned her the nickname "Hippy Vet" from my husband. We ran through Ghost Cat’s medical history and diet, and the vet explained that the problem was unlikely a urinary tract infection or crystals. She asked if the typical household chaos associated with moving had already begun for us. I shrugged, telling her we’d already been packing a little, but since my husband and Ghost Cat would be staying behind for three more weeks after my initial move, much of the apartment was still intact. The vet said the move might be stressing Ghost Cat more than we realize. She then told me her best guess was that Ghosty was suffering from feline idiopathic cystitis. With that, she took Ghost Cat away to another room to use a needle on her bladder to get a pee sample. The vet returned my baby to me before dashing back out of the room again to do something with that syringe full of cloudy pee. While we waited for the vet to come back, I tried to comfort Ghost Cat, but my normally super cuddly kitty was having none of it. She just wanted to stick her head and front paws into my purse. I figured she wasn’t hurting anything and was maybe just smelling the smell of home, so I let her keep digging through the forgotten restaurant mints and other debris at the bottom of my bag. 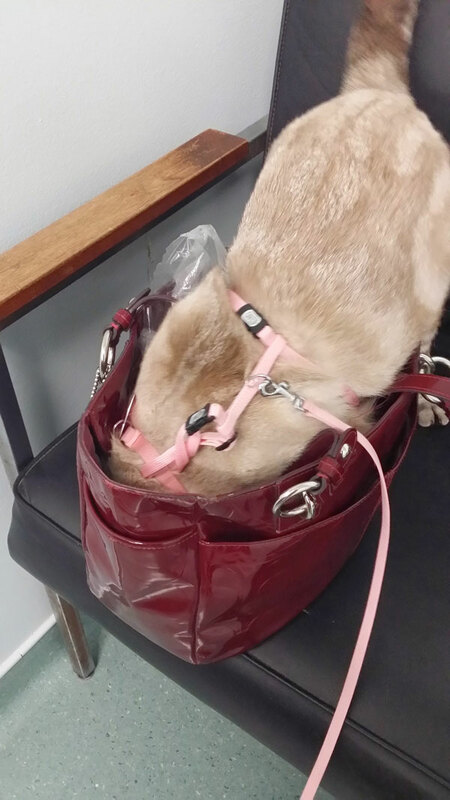 Then, suddenly, she brought her hind legs into the purse too, so she was totally inside it. I hesitated, but then moved in swiftly as she began to squat, pulling her out of my purse in the nick of time and sending a stream of urine splashing down onto my boots instead. Cursing ensued. I couldn’t believe what just happened. My beautiful, lovable cat — who had never, ever, peed outside of her litter box — had just tried to pee IN MY PURSE. Something was very wrong. The vet came back into the room as I was cleaning the pee off my boots with a clump of paper towel. I told her what happened and she began asking me about possible stress in Ghost Cat’s world again. I explained how we had recently switched from one very expensive dry food to another very expensive dry food, and were only giving Ghosty about a tablespoon of her favorite wet food in the mornings. We’d also recently removed her gravity water feeder because she kept knocking it over. We’d of course replaced it with regular pet bowls, but apparently Ghost Cat doesn’t like drinking from those. The vet said we had to give her back the water feeder and make some serious changes to Ghost Cat’s diet. She said our kibble (while organic and expensive) was probably the cause of Ghost Cat’s weight gain and dehydration, and she recommended we switch exclusively to wet food for a while. I bought cans of special urinary health wet food from the vet before heading home. The wet food did a little damage to my credit card, and so did the $100 test I agreed to order on Ghost Cat’s urine. The vet said it was probably best to order the test since this was the first time anything like this had happened to Ghost Cat — and I agreed. My cat’s health is worth spending some money on. Once we were home from the vet, the change in Ghost Cat was almost immediate, even though all we did was change her food. The red in the litter box never returned. She had no accidents and didn’t even go near my purse. She was happy to eat the urinary health wet food, and we tried everything we could think of to get her to drink more water. Refilling the bowls in front of her seemed to encourage her to take a sip. A week went by before we got the test results. I was just getting off the plane in my new city when I checked my voicemail and got the message from the vet. She said Ghost Cat’s urine came back clean. I forwarded the message to my husband, who is Ghost Cat’s custodial pet parent until we’re reunited in our new home next month. I worry that Ghost Cat will be stressed out when she has to make a six-hour drive in a moving truck with her dad, but I’m starting to think that her problem was more about dehydration and diet then stress. Have you ever moved your cats? 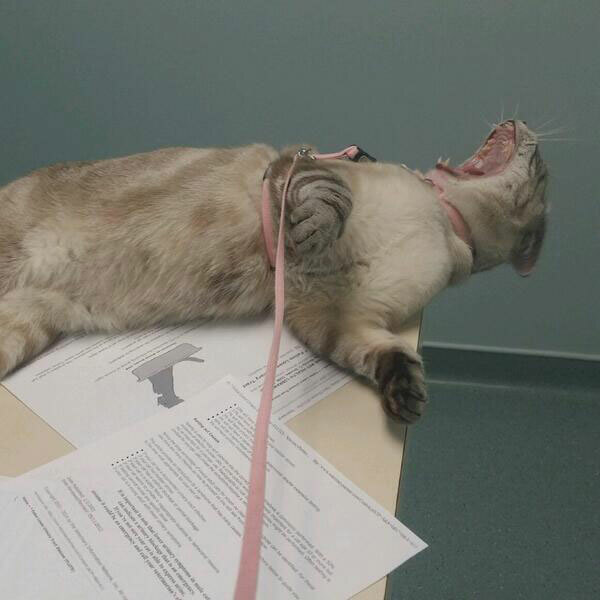 Were they stressed enough to have a feline idiopathic cystitis flare-up, or any other issues? How did you monitor their health during the transition? Let me know in the comments! What Can Be Done for Cats with Chronic Bladder Problems? Ask a Vet: Why Do Cats Urinate Outside the Litter Box? 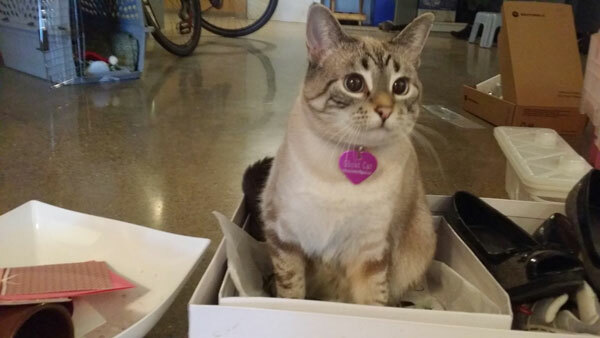 How Do You Prepare Your Cats for a Big Move?